Buford, we jest cain't have nice thangs! Buford, we jest cain’t have nice thangs! I just can’t get over how some people’s homes look like a showroom for HGTV (Home & Garden TV), and I don’t mean the Martha Stewart-esque type of person. I mean the kind of homes where there are obviously kids in residence, but the kids are either alien pod people in disguise or they’ve been programmed a la Stepford, because no child is naturally that freakishly neat. Either that, or I must be a dismal failure as a mother, because my children have the ability to untidy a room without even setting foot in it. It’s their special superhero power. We’ve tried storage solutions out the wazoo (our latest is a $50 9-hole cubby shelf, with $21 of matching bin drawers from Target – $7 each! ), zippy bags for different categories of toys, tubs, bins, boxes, you name it! And then there’s property damage to contend with. The one-of-a-kind custom-made antique coffee table that I inherited from someone has been plastered with stickers, dribbled with paints, encrusted with playdough and various I-shudder-to-think food substances, and banged on with blocks. I’ve tried to stop these activities, but as you might guess – with 4-yr-old twins, I’m pretty much banging my own head on a brick wall here. And our prized IKEA 9’x10′ area rug, $75 on sale, has been puked and peed on, paint spilled on, food flung on and then ground in for good measure…let’s just say that it’s a good thing we got it in beige! 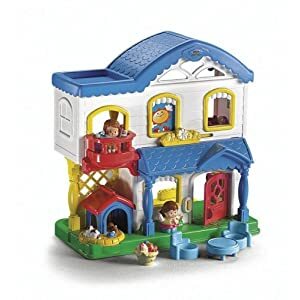 I donated the twins’ Fisher-Price dollhouse, because it was a bit small and babyish for them (and they had taken to scaling the roof and standing on top of it and jumping off), and got an unfinished wooden dollhouse (at 40% off with coupon!) at Michaels, which the girls proceeded to dismantle (rip to shreds) before I could even start painting it! And they were starting in on their train table, when I decided to sell that on craigslist. So, I’ve begun telling them that if they don’t treat their toys nicely, I’ll give them away (the toys, not the girls) to families that have children who take good care of their toys. The twins seemed mildly interested by this, but it hasn’t seemed to sink in. Any ideas from the other mamas and daddys out there? Thanks for visiting Locomotion of Expressions, following you back via GFC!